The 128-room Spanish-style Hampton Inn Florida Mall provides affordable quality accommodation equally suited to couples or families on vacation. The property is within walking distance of the Florida Mall, the largest indoor retail center in Central Florida, with 270 stores, movie theaters and over 20 restaurants. Items included with the room rate are an expanded continental breakfast, high-speed Internet access, local telephone calls, a copy of USA Today, parking and coffee available in the lobby 24/7. Area landmarks and attractions include numerous golf courses, the theme parks at Walt Disney World, Downtown Disney, Sea World, the Wet 'n Wild water park, Universal Studios, the Islands of Adventure amusement park, Gatorland, the Florida Citrus Bowl, and Amway Arena, home of the Orlando Magic basketball team. Rooms come with a choice of two queen-size beds or one king size bed. The amenities include a work desk with high-speed Internet access, 32-inch flat screen television with cable movie and news channels, pay-per-view movies, two-line telephone with voicemail, alarm clock, tea and coffee making facilities, iron and ironing board and a hairdryer. This hotel has a landscaped enclosed courtyard with a large swimming pool. The complimentary breakfast is the only meal served here. Nearby restaurants include a TGI Fridays, Chilis, Chilis, Bennigans and an Olive Garden. The 24-hour front desk has information on the Orlando events and attractions. 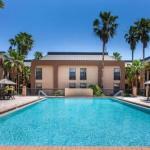 Other amenities include a guest laundry, fax and copying services, daily housekeeping and ice and vending machines.